Have you ever wondered what e-commerce is or what the exact meaning of the term was? What differences are there between this term and other similar ones? Surely you have since online business is more popular than ever. However, despite its spread, a lot of people still don’t really know what it is. For this reason, this post’s objective is to explain the exact definition of e-commerce, how it differs from similar terms, the different types that exist, and its advantages compared to traditional businesses. Are you ready to learn everything you need to know about electronic commerce? A system for the buying and selling of goods and services using the Internet as the main means of exchange. In other words, it is a business that electronically manages both the collections and payments. 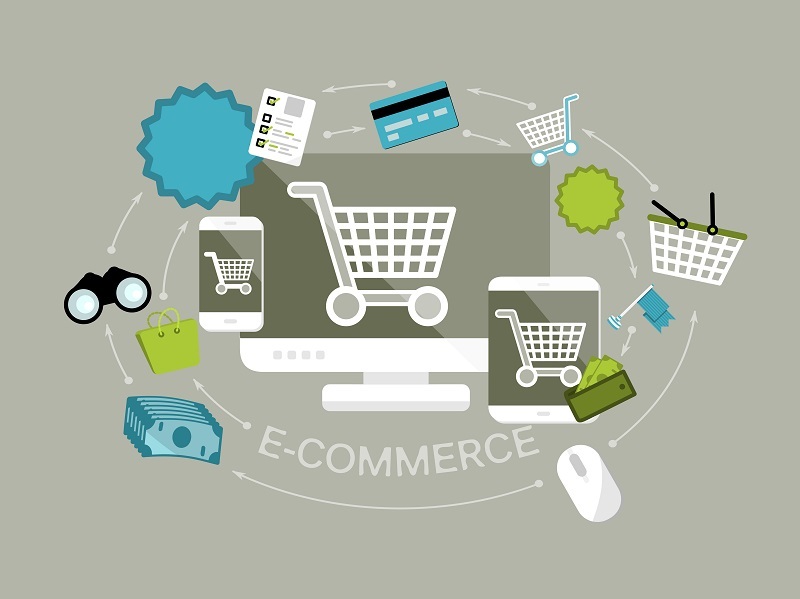 E-commerce is often confused with e-business, although they have nothing to do with one another. E-commerce only refers to the goods and services transaction between a seller and a consumer, whereas e-business refers to the complete process necessary to manage an online business. The e-business concept is wider than the e-commerce one and e-commerce is actually a part of e-business since it is a type of business model. The e-commerce field is really large and there are a lot of different models. A general one based on who the buyers and sellers are. Another one with different e-commerce “models”. B2B (Business-to-Business): businesses whose clients are also businesses or organizations. For example, we could think about a construction materials company selling its products to arquitects and interior designers. B2C (Business-to-Consumer): businesses that sell their products or services directly to the consumer. This is the usual type and there are thousands of examples of clothes, shoes or electronics stores. C2B (Consumer-to-Business): sites in which consumers offer products or services and businesses bid on them. We are talking about the traditional websites for freelancers such as Freelancer, Twago, Nubelo or Adtriboo. C2C (Consumer-to-Consumer): businesses that facilitate the selling of products amongst consumers. The clearest example is eBay or any other second hand website. In addition to these types of electronic commerce, there are other popular types such as G2C (Goverment-to-Consumer), C2G (Consumer-to-Goverment) or B2E (Business-to-Employer). As you can see, e-commerce is more than a simply transaction in a store. The online sector is still not very mature. Technology is always changing and the new online businesses that are popping up are trying to meet the new needs being created. Dropshipping: For the client, everything looks like a normal e-commerce shop. The difference is that it is not the e-commerce shop seller who sends the product, but rather a third party. In order to learn more about this, you can read our guide to finding dropshipping suppliers. Affiliate e-commerce: A step further back in the buying process we can find affiliate businesses. In this case, not only does the shop not send the product, the purchase completion is not even carried out via its platform. What these businesses do is sending clients to different shops in exchange for a commission that they receive once the purchase is completed. Affiliation is very common with Amazon. For example: Biodegradable.es. If you are interested in this type of business model, read this specific post about affiliate marketing and this other one about selling without stock. Membership: This type of e-commerce aims for recurring purchases. They achieve this by using periodic subscriptions (weekly, monthly, bimonthly, etc.). These types of memberships are in currently in fashion with the so-called “surprise boxes”. They are boxes that are sent each month with different products, for example, a monthly box with different craft beers. Instead of selling the product just once, the shops offer the option of receiving it with a predetermined frequency. For example: Manolitoandco.com. Marketplace: A marketplace is a department store. It is a website where different sellers offer their products from one or more sectors. Amazon is also an example of a marketplace. Although it also works as a normal e-commerce shop, everyone can sell using the platform in exchange for a big commission for Mr. Bezos. Services: An e-commerce business doesn’t only have to be about selling products. Training, counselling, mentoring, or any other exchange of time for money is another viable option in order to start a business without risks. As we already mentioned, advances in this sector are made every day, which means that new types of e-commerce shops are showing up every day. Perhaps we should do a deep analysis of the pros and cons of starting an e-commerce shop? Is it easy? Is it worth it? Why e-commerce has flooded the Internet and has become a standard so quickly? Because the advantages of e-commerce compared to traditional commerce are really powerful. More clients. There is no local store or company with sufficient offices in different cities that compares with e-commerce’s reach. The possibility of selling and buying from any part of the world expands the target public and allows the company to gain more clients. No schedule: E-commerce does not run on schedules, whereas it is nearly impossible to find a traditional store that is open 24/7. Websites are open all day long and clients can buy whatever they want whenever they want it. Less costs: not needing a physical store reduces the costs of running a traditional business. In addition, when e-commerce brings suppliers together with consumers there are not even production costs. Bigger profit margin: cost reduction and market extension mean that, even with lower prices, a bigger profit margin can be obtained than with a traditional store. More products are sold and more money is made. After having read this you may think that starting an e-commerce shop the cure-all, e-commerce does not come with only advantages. That is why it is also advisable to analyze the challenges that you will have to face when you begin your online adventure. We wanted to call them challenges more than disadvantages to avoid showing a distorted picture. Lack of trust: Although payment platforms have evolved to the point of being as secure as any physical business, or even more so, a lot of people still think that less payment security, lack of trust. This means mistrust. We can help solve it by adding an SSL (https) certificate that encrypts the transferred information as well as by adding other stamps that transmit the necessary trust. Products and services that “cannot be seen or touched”: Everyone likes the feeling of making a good investment. A way of making that feeling real is by seeing and touching the products with our hands. That tangible feeling is missing in an e-commerce shop. How can we solve it? With very thorough product cards and by adding images, videos, and very detailed descriptions of the products. Requiring access to the Internet: This is obvious, but to be able to buy and sell, you need a connected device. Nowadays, the large majority of people have this kind of access, but there are some sectors in which the target audience is either older or less “techy”, which could be a problem. Technical problems: Any type of entrepreneurship, whether it is offline or online, implies dealing with unfamiliar issues. In the specific case of an e-commerce shop, the technological part requires a minimum knowledge that not everyone has. The best way to solve this is by outsourcing that part, although, of course, that carries a cost. Competitors: The initial investment in order to start an e-commerce is not as high as the initial cost of a physical business. This means more competitors. It takes time to get results: When a physical store is opened, the products are being shown to potential clients right from the very first minute. For an e-commerce, gaining visibility is more difficult than most people may think. You could have a great product and a great platform, but if you don’t work on your visibility, nobody will see them. Nevertheless, we think there are significantly more advantages than disadvantages. In fact, improving the return policies and the evolution of the security system will end up eliminating these disadvantages. How about rolling your sleeves up and really digging into how to create it? Now that you know what it is and you have a general idea about the pros and cons, let’s see how to get started. Do you already have an idea or are you starting from scratch? If you don’t have a clear idea, there are several strategies for finding possible opportunities. They are all about opening your mind and being attentive to observe every daily situation from an entrepreneurial point of view. If you are walking around, have a look at every single physical business you see and think if its products could be sold on the Internet, if they aren’t already. What things do people normally complain about? Or even better, don’t use your walks to think about this, but rather establish a day and time to go out and look for ideas. Look at what people wear and how they behave. Observe and write down any ideas you may think of—without filtering them. Always think about solving people’s problems and bear in mind that the entrepreneur’s mind needs training. The first days when you start going to the gym make your body sore until it becomes accustomed. This is no different. But the most important thing is that you have this idea clearly in mind: don’t sell products, solve problems. The second step is about narrowing down the first list of ideas until you have just a few. Value proposition: What is its value? Which need does it meet? Market: Is it a new product? Is it an already existing product with new functionalities? Competitors: Who is already meeting the needs that you have detected? Could you improve upon it? Demand: Is the problem that you are going to solve widespread enough to create sufficient demand? Check to see how many people are looking for it on Google. You can use this Keyword Planner. An excellent way of analyzing ideas is by using this basic entrepreneur’s tool: SWOT. SWOT is a matrix that, from an internal an external point of view, analyzes the Strengths, Weaknesses, Opportunities, and Threats of your idea. In the UK, 167.717 new companies have been registered from January to March (source), but most of them start out in a very disorganized way without designing any type of strategy. And be sure that clearly knowing where to go and by which means will determine the success of your e-commerce shop. How is your ideal client going to learn about you? Why are they going to prefer you to your competitors? Are you going to be cheaper? What defines your clients? What characteristics do they have in common? What are your business goals? How are you going to grow? In order to define your e-commerce strategy we are going to use a business model canvas. This template allows us to quickly and easily summarize the keys of a business. Spending the time to fill in these 9 boxes will help you find out what’s important for your idea and how to carry it out. Up to this moment you have only defined general ideas and goals. It is in this fourth step where you need to be more precise and define specific actions in line with the established strategy. Name: This is one of the biggest headaches at the beginning. Our advice is to follow basic guidelines, such as to making it short, easy to pronounce, and that it is available for the .com domain and main social networks. Hosting: An e-commerce business needs a host. Don’t worry—in this post we explain how to choose a webhost for an e-commerce. Corporative identity: Here we are not only talking about the colors or the logo but about the values you want to transmit—the real brand essence. Reading this post about how to create your brand image will help you. Website: Who is going to build your website? If it is not going to be you, you will need someone to have it done or to advise you. Check out the different options depending on your business model: PrestaShop, WordPress, Shopify, etc. Visibility: We mention it last here, but this is actually the most important and most forgotten part of the plan of action. Most entrepreneurs make huge efforts to have a good product and a good website to sell it, but they don’t think how to reach the client. Last but not least, you can’t forget the legal requirements: are you going to start a Ltd.? Are you going to register yourself as a freelancer? Do you feel like starting your own digital business? It is possible that you now have a thousand questions. Don’t worry—that’s normal. Analyze your business idea and if you decide to go for it, establish the plan of action.